Thank you for considering Lansing Center as a destination for your conference/convention. This section has been created for your specific planning needs. From here, you can get floor plans, find the services you will need and more. If you wish to contact sales, please email us at sales@lepfa.com. A sales team member will reply within one business day. Attendee registration is easily accessible on our main concourse or room options such as our coat room area. Registration tables come clothed in linen and skirted at no extra charge. Other registration options are available upon request. We have the capacity to accommodate general sessions from 50 to 2500. Our ballroom is divisible into 8 banquet sections and any multiples of 2 therein. Typically, a general session for 250 attendees will fit nicely into 4 banquet rooms with room for a 16’ x 24’ stage and a dual projection package. For general sessions larger than 750 at rounds of 8, our exhibit hall space is a great alternative. Breakout sessions are easily planned with 10 individual meeting rooms or varying combinations that can be altered to suit your needs. Rooms come with in-room audio visual screens (with the exception of 3 rooms), in-room sound capabilities and varied lighting options. See our seating capacity sheet for possible room combinations. With 72,000 square feet of divisible, pillar-free exhibit hall space available, Lansing Center is capable of accommodating over 360 10’ x 10’ exhibit booths. Exhibit floor access through (3) exhibit loading dock areas, one with each hall division, makes exhibitor load in and load out a breeze. Exhibit dock doors can be raised to 21 feet in height with a 15 foot width, enabling easy access for large equipment display. Floor pockets situated throughout the exhibit space enables easy access for your power requirements. If you plan to have exhibitors, our trade show planning section will be helpful to you. 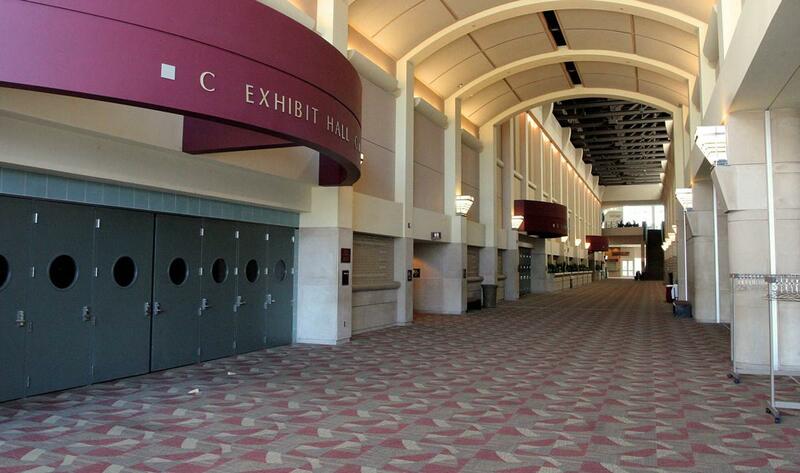 Our robust wireless internet system is accessible by all who attend events at Lansing Center. Through an easy and quick registration, attendees can choose the speed of access they require at reasonable rates. Group rates for your attendees can be quoted through our sales or event services departments.